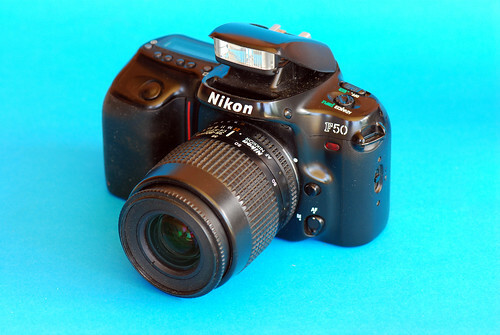 The F50, sold as the N50 in the United States, was an entry-level 35mm film Single-lens reflex camera which was introduced by Nikon in 1994. 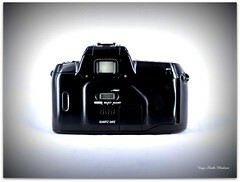 It was aimed at the lower-end of the amateur autofocus SLR market. The F50 was replaced by the similarly-priced F60/N60 in 1998. 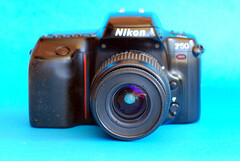 Lens: kit lenses AF Nikkor 35-80mm f/4-5.6 D and AF Nikkor 80-200mm f/4.5-5.6D. 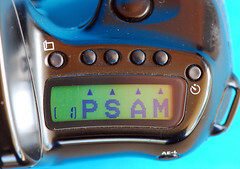 Shutter: Electronically controlled vertical-travel focal-plane shutter; 1/2000 sec. to 30 sec. Dimensions: 149 x 96 x 70mm; weight approx. 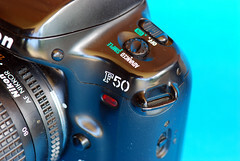 580g. 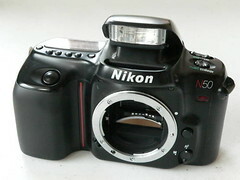 Nikon F50 / N50 Technical Specifications at Photograph in Malaysia. This page was last edited on 11 February 2019, at 05:04.